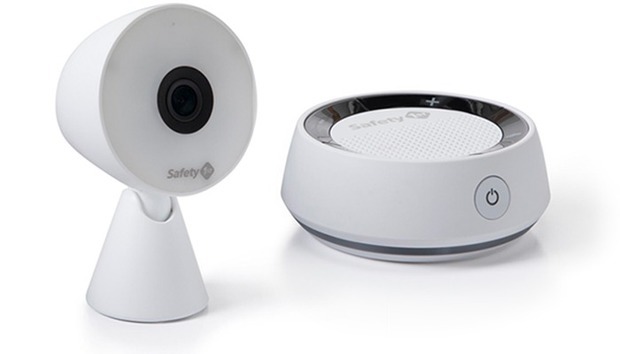 As video baby monitors become the next frontier for smart security camera manufacturers, it seems only fitting that Safety 1st—the child-safety company that introduced the Baby On Board sign more than 30 years ago—would get in on the ground floor. The bell-shaped camera is attached to a conical stand and has a few degrees of tilt. It doesn’t need much, though, as the lens’ 130-degree field of view can easily take in the whole of most rooms without futzing much with camera angles. It streams in 720p resolution and has 12 infrared lights that provide up to 15 feet of night vision. The camera works with the Safety 1st Baby Monitor app, much like a home security camera, providing a live video stream, recording video clips, and pushing alerts to your device when motion or sound is detected. 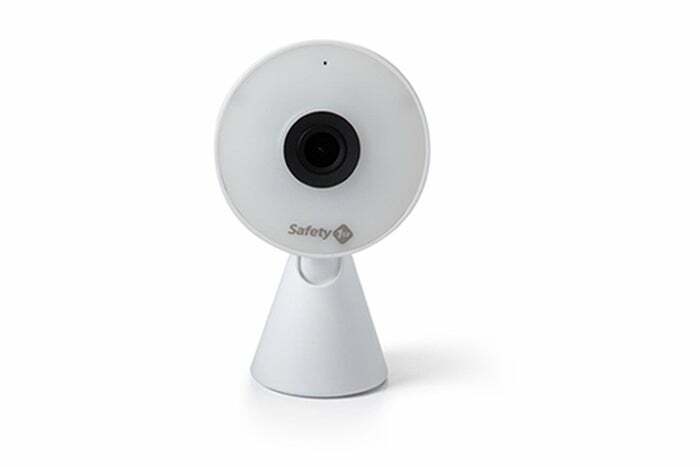 The Safety 1st HD WiFi Baby Monitor pushes alerts to your smartphone and records video when it detects your child's activity. The audio unit is a palm-sized disc with a 1.5-watt speaker. It’s designed to be your monitor when your smartphone isn’t at hand, so in addition to being your ears on your child, it also alerts you to detected sound and motion by illuminating a blue LED ring around the bottom. On the top of the unit you'll find a button for turning this light indicator on and off, a pair of speaker volume controls, and a mic button for activating the two-way talk feature when you want to soothe your baby. The camera runs on AC power, while the audio unit has a rechargeable battery. The latter needs to be charged before you start the set-up process (a USB-to-Micro-USB cable is provided for this). According to Safety 1st, the audio unit can run for 12 hours on a full charge. Once everything is powered up, the app guides you through a simple pairing process that in my testing worked without a hitch. The audio unit is small enough to carry around with you, but it’s meant to be stationary—as evidenced by the rubber pads on the bottom--so you can be hands free. The good news is it stays in quiet mode until the camera detects activity, so you don’t need to deal with ambient noise as you go about your day. When it activates, the output is exceptionally clear and detailed, even at higher volume, and it was easy to discern between different but similar sounds, like a cat rustling the curtains versus a child stirring in the sheets. The LED alerts worked reliably, but because the ring is around the base of the unit, I found them easy to miss if I wasn’t focused on it. You can share moments captured on video through a variety of services. Remotely peeking in on a child will likely be the more popular use for this system, and the Safety 1st app makes it incredibly easy. The app opens to the live feed across the top of the screen, and you can activate full-screen mode by rotating your device horizontally. 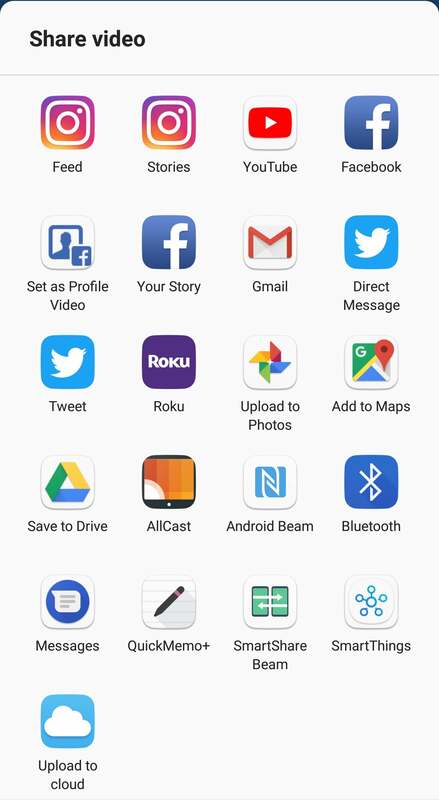 In either orientation, there’s a button for activating the camera’s microphone and another for taking shareable screenshots. These are saved, along with sound- and motion-detected video clips, in a “recorded baby moments” gallery across the bottom of the screen. Videos are stored free in the cloud and are viewable for 24 hours, but you can also download them to your device or to personal cloud storage. When sound or motion is detected, the system pushes an alert to your device. Tapping on this notification opens the recorded clip of the event in the app. You can customize the motion and noise detection sensitivity for the alerts you receive on your phone and on the audio unit. The scale is composed of five preset levels from “very low” to “very high.” The higher sensitivity levels will detect soft cries and calmer movements while the lowest will only alert you to “extreme” activity. The streaming and recorded video quality is excellent. It’s a world away from the fuzzy footage associated with conventional VGA monitors. The image is tack sharp, with rich and accurate colors. Parents will likely find they want to share the more precious of these captured moments, and the app makes that easy with a button that lets you post images and video directly to popular services such as Facebook, Instagram, Twitter, and Google Drive right from the playback screen. You can grant camera access to babysitters and other caretakers. Speaking of sharing, parents can grant camera access to babysitters and other caretakers, too. 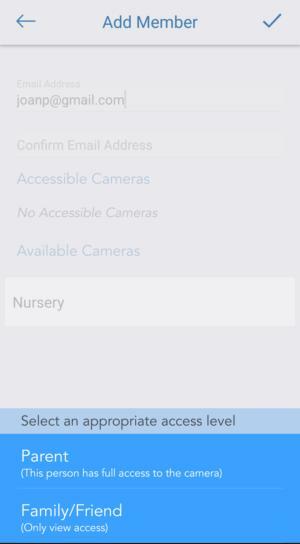 An “add member” option allows you to invite people on a per-camera basis and assign each one an appropriate access level: a “parent” designation gives them full camera access, while “family/friend” allows them only viewing access. There are a few features I missed that many parents might also. The camera doesn’t play lullabies or soothing nature sounds, and it doesn’t include any environmental sensors for monitoring the temperature or humidity in your child’s room to help maintain their comfort. These are features offered on the Netgear Arlo Baby and are also common to VTech’s conventional baby monitors. If you want the advanced capabilities of a smart device and can live without those extra bells and whistles, though, the Safety 1st Baby Monitor will deliver.